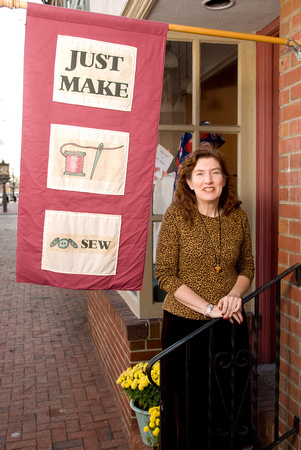 Just Make it Sew -- in addition to this online store -- is an independent Fabric Boutique and Sewing Studio located in the historic downtown Bordentown, NJ. Just Make it Sew offers a variety of goods and services related to fashion and sewing, focusing on three things: selling designer and apparel fabric that you will find here, (including specialty and lesser known designer patterns and notions); sewing classes, workshops and individual lessons; and custom sewing and alterations. You will find our "brick-and-mortar store" on the 300 block of Farnsworth Ave. in Bordentown, NJ across from Beneficial Bank and next to Bordentown City Hall. Our unique collection of deisgner and designer quality fabrics and notions is carefully selected & coordinated with you in mind and constantly changing. Because our website inventory is managed out of our shop inventory, we occasionally may not have all the yardage you are seeking. If you are seeking a large quantity of a fabric shown here, we welcome your inquiry before you place your order. In the store you will find JoAnn, the store owner along with others. JoAnn has a degree in Fashion Merchandizing and Retailing from LIM in NYC and a degree from FIDM in Los Angeles, CA. She has worked in the fashion industry her entire working career, working at Bloomingdale's, Bergdorf Goodman and Barney's in New York and managing stores for JoAnn's Fabrics and Crafts, before starting Just Make it Sew. JoAnn is certified by Palmer Pletsch to teach Pattern Fitting. We welcome your suggestions as to how we could best serve you -- our customers. And, if you are ever in the area, please feel free to stop in and have a look around.